Even in California, we have a winter season that is just too cold for boating. 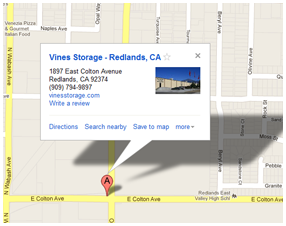 When Highlands-area residents decide to park their boats for a few months, many of them choose to store their watercraft temporarily at Vines Storage, located just off Interstate 10 in Redlands. When the winds start to become cold and winter activities fill your weekends, there are a few things you should do before storing your boat for the season. Take it for a spin: One last time before you store the boat, take it out on the water. Listen closely for any strange or unusual noises and take note of anything that may seem off mechanically. Think about any upgrades you want to make before spring and call your boat shop to schedule any maintenance or repairs. It's a great idea to take care of these mechanical things over the winter season when you're not using your boat anyway. That way, by the time the weather warms up, you'll be ready to jump on the boat and go. Clean and organize the boat: Remove all the food, boating supplies, and other items that you may store on your boat during the summer season. Food and items that expire, such as sunscreen can be thrown away while life jackets, toys, or other items can be stored elsewhere. In addition, it's good to perform a deep cleaning of the entire boat before putting it away. This ensures that your boat is stored in great condition. Winter maintenance: Before you store the boat, top off the fuel tank, check the oil, and replace all of the filters. You should also check the coolant, hoses, and belts. If this is your first season putting away the boat, consider asking an expert to help you with this step. This ensures that no vital steps are missed. When looking for a place to store your boat, look for a location that offers protection from the elements along with great safety and security. At Vines Storage, our facility is secured by an 8-foot wall, a single entry point secured with a keypad entry, and more than 30 cameras. Furthermore, we offer inside and outside storage locations, flexible leasing options, and great amenities. Whether you're looking for a place to store your boat during the winter months, or if you need a longer solution, we have the right leasing terms for your needs.